We are thrilled to have an outreach concert entitled TOGETHER for Children with special needs and their families. NYCP is proudly supported by NY Nanum Foundation, Korean Community Center and Moms Mission. TOGETHER will take place at Korean Community Center in Tenafly, NJ on Saturday, Sep 29 at 3pm. New York Classical Players is thrilled to announce two great artists, Siwoo Kim and Nikki Chooi as concertmasters for the 2018/19 season. Mr. Kim is one of the founding members of NYCP and Mr. Chooi appeared as a guest concertmaster during the 2017/18 season. New York Classical Players (NYCP) has named flutist Jasmine Choi as its incoming Artist-in-Residence. 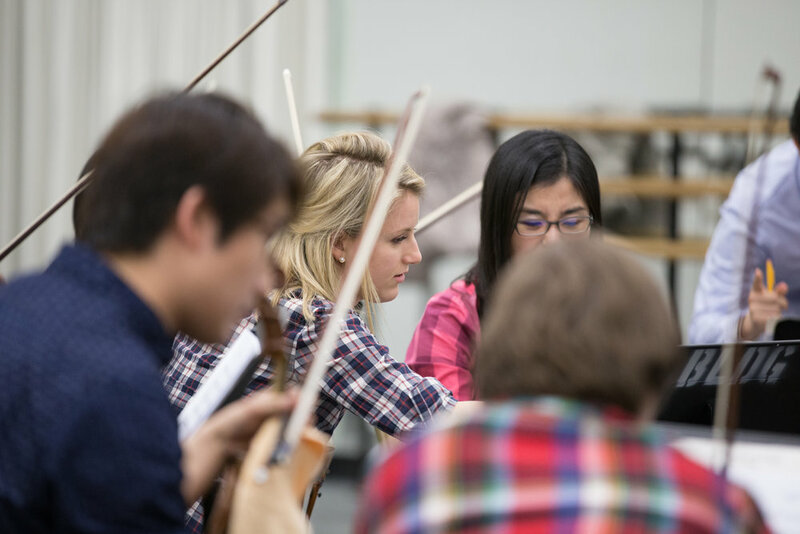 Beginning in September 2018, Ms. Choi’s three-year residency will feature the acclaimed musician performing three newly-commissioned concertos with the ensemble. Highlights of the performance season include world premieres by Clint Needham and Eric Nathan, performances by violinists Pamela Frank and Stefan Jackiw, cellist Peter Wiley, pianist HaeSun Paik, and flutist Jasmine Choi. All programs will be conducted by NYCP’s founder and Music Director Dongmin Kim. "New York Classical Players believe that access to musical excellence is an essential human right and presents all performances free of charge." NYCP is the region’s only professional orchestra sharing exclusively free performances. Comprised of creative and virtuosic young musicians, NYCP’s adventurous programming shares familiar masterpieces, bold new commissions, and unexpected musical treasures. Each season, thousands of NYCP concertgoers experience both the dynamic power of the orchestral repertoire and the versatile intimacy of chamber performance. NYCP is proud to collaborate with some of the world’s most renowned musicians, including Kim Kashkashian, Cho-Liang Lin, Stefan Jackiw, Sumi Jo, Alex Kerr, Donald Weilerstein, and Chee-Yun, and is under the baton of Music Director and Founder Dongmin Kim. New York Classical Players (NYCP) is an ensemble dedicated to the highest standards of artistry, collaboration, and virtuosity. Inspired by the belief that access to musical excellence is an essential human right, NYCP presents all concerts free of charge. New York Classical Players Announce 2018-19 Season with World-Class Soloists and Sensational Artistry led by Music Director and Founder Dongmin Kim. NYCP’s ninth season shares 18 free performances of world-class talent throughout the metropolitan region with works that showcase extraordinary selections for chamber orchestra. New York Classical Players, the region’s only professional chamber orchestra dedicated to accessible programming, announces a season of creative exploration, world-class talent, and collaborations with partnering venues ranging from neighborhood churches to Lincoln Center’s Library for the Performing Arts and Flushing Town Hall. The ensemble’s ninth season begins on September 27 and features more than 20 concerts in Queens, Manhattan, the Bronx, and New Jersey. All performances are shared with the public completely free of charge, in keeping with the ensemble’s mission of accessibly artistry. The season begins on September 27 with a three-concert series beginning at Flushing Town Hall. “Goddess of the flute” (Korea Times) Jasmine Choi returns to the ensemble for a dynamic programing of musical pyrotechnics. Audiences will recall Ms. Choi from her recent performances in the Mostly Mozart Festival and past performances with NYCP, as well as other solo turns in the metropolitan area. A native of South Korea, Ms. Choi lives in Austria and was recently named one of the top 10 flutists in history. NYCP’s opening program considers the rich borrowing of folk music within classical music: Sarasate, Bartok, and Grieg. The world premiere of Needham’s “Pocket Concerto” concludes the program, exhibiting the ensemble’s ongoing interest in the full chronology of works for chamber orchestra – from Baroque masterpieces to brand-new creations. The final performance of this series is presented by the Si-Yo Music Society Foundation in their “Classically Leonia” series at the Leonia United Methodist Church. In November, cellist Peter Wiley returns to the stage for Brahms’ Double Concerto for Violin and Cello, joined by violinist Pamela Frank in her NYCP debut. Ms. Frank’s versatile career spans concerto solos with leading orchestras including the New York Philharmonic and San Francisco Symphony, sought-after chamber music appearances, and a prodigious career as a pedagogue and injury-prevention specialist for musicians. Mr. Wiley, formerly Principal Cellist at the Cincinnati and Pittsburgh Symphonies, is an internationally-recognized soloist and collaborative musician. Both are on the faculty of the Curtis Institute of Music. They join NYCP for a series linking the triadic progress of Brahms, Schoenberg, and Webern, enveloping Brahms’ Double Concerto with Schonberg’s Verklärte Nacht and Weben’s Langsam Satz. Pianist HaeSun Paik - whose performances a “a wonder — elastic, mercurial, charged with meaning, surprising" (Boston Globe) - returns to NYCP in February for a continuation of the ensemble’s Beethoven Project:, a commitment to perform all five Beethoven Piano Concertos with Ms. Paik. In three performances, Ms. Paik will Beethoven’s stirring First and dazzlingly powerful Third Piano Concertos, alongside a contemporary concertino by Samuel Adler. In April, concertmaster Nikki Chooi serves as soloist for “Baroque Melting,” a program reimagining the familiar strains of the Baroque era. Selections by Chausson, Stravinsky, Geminiani, W.F. Bach, and Vivian Fung conjure Baroque complexity and lyricism through new evocations. The season’s final orchestral program concludes in May as violinist Stefan Jackiw – noted for artistry of "uncommon musical substance" that is “striking for its intelligence and sensitivity” (Boston Globe) and clarinetist Yoonah Kim, winner of the 2016 Concert Artists Guild International Competition, offer a world premiere of Eric Nathan’s new Double Concerto. Mozart’s beloved “Eine kleine Nachtmusik” and Divertimento No. 3 in F major expand the program into a captivating program that examines virtuosity throughout the centuries. Beyond NYCP’s orchestral programming, the ensemble’s musicians are featured in a three-concert chamber music season at The Library for the Performing Arts at Lincoln Center. The Library welcomes NYCP back to the Bruno Walter Auditorium for the fourth year. Curated by Artistic Producer Evan Leslie, NYCP’s four-concert chamber music series celebrates individual genius and interdisciplinary artistry with a season dedicated to Bach and Mendelssohn. Programs challenge performance conventions by featuring guided conversations with NYCP’s ensemble members and opportunities for audience questions. Performances will include Bach’s evocative suites for unaccompanied cello, his Goldberg Variations for string quartet, and gems from Mendelssohn’s prodigious early years. In recognition of Jerome Robbins’ centennial, rehearsal and performance footage of his Suite of Dances with Mikhail Baryshnikov will be screened alongside NYCP’s performances. NYCP performances are offered to the public at no cost and regularly reach capacity, demonstrating the ongoing need and interest in classical music throughout the metropolitan region. For NYCP fans who cannot attend concerts in person, the ensemble is thrilled to add video livestreaming this season. At least one concert for each performance cycle will be available online to audiences, made possible by the generosity of Meadou Kim. Adding streaming is part of NYCP’s ongoing initiatives to bridge technological innovation with classical performance - the ensemble’s YouTube channel has more than 1.7 million views as of August 2018. NYCP is proudly supported in part by public funds from the NYC Department of Cultural Affairs in partnership with City Council, the Lower Manhattan Cultural Council, and the NY Nanum Foundation. The ensemble is a recognized nonprofit, under the leadership of Board Chair Charlene Wang.